The Hernando sheriff has provided a collection box for worn U.S. flags so they can be properly disposed of. 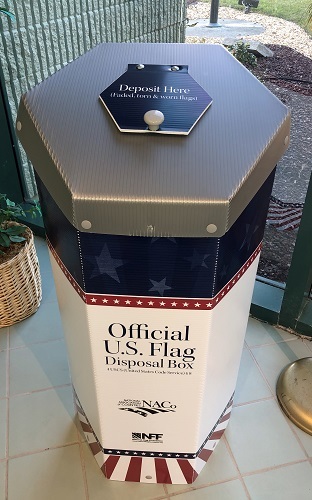 HERNANDO COUNTY – In partnership with the National Association of Counties and the National Flag Foundation, the Hernando County Sheriff’s Office has installed a flag retirement box, at no cost to the county, in the lobby of its main office, 18900 Cortez Blvd., Brooksville. “We are pleased to provide these flag retirement boxes. Helping residents properly dispose of worn U.S. flags is consistent with our commitment to public service and community engagement,” said NACo Executive Director Matthew Chase. Flags should be folded respectfully before being placed in the box. The U.S. Flag Code prescribes flag etiquette that includes everything from flying it near other flags to instructions on how to raise and lower it. “The flag, when it is in such condition that it is no longer a fitting emblem of display, should be destroyed in a dignified way, preferably by burning,” according to the code. Members of the Boy Scouts will be responsible for the proper disposal of the worn flags. Hernando Sheriff’s U.S. flag retirement box. Photo of flag retirement box courtesy of the Hernando County Sheriff’s Office. Main photo is stock, file photo.